The new Dura-Bond ERW steel pipe mill in McKeesport, Penn., sits on the original site of National Tube Works, which began production in 1872. After United States Steel acquired National Tube in 1901, the company continued to expand, and McKeesport became known as “The Tube City.” At one time, more pipe was produced in the city, than anywhere else in the world. In 1964 the ERW mill was built by U.S. Steel. In 2013, U.S. Steel Tubular made massive investments in the plant to improve reliability, capability and quality. The mill’s entry area was renovated, and a modern drive installed. U.S. Steel also rewired the entire facility and added a programmable logic controller (PLC) system. The plant’s mill drives were upgraded in 2013 with AC motors, increasing power and improving dependability. A new edge miller was installed, and the shear upgraded. U.S. Steel also rebuilt the hydro-tester and added new tooling to accommodate all pipe within the plant’s outside diameter (OD) range. “The addition of the McKeesport ERW pipe mill to the Dura-Bond family strengthens our position as a critical American manufacturer in the line pipe industry. Our range of steel pipe and pipe coatings now meet the requirements of most pipeline projects in North America,” according to Jason Norris, president, Dura-Bond Industries. Today, this 317,000-square-foot plant employs advanced high-frequency electric resistance welding (HFW) technology and produces API 5L line pipe and ASTM certified steel pipe. Dura-Bond has made improvements that incorporate new technology with the plant’s existing functionality. These improvements can be found throughout the facility, from improved coil trimming capabilities to the PLC-controlled OD pipe stenciller. Dura-Bond’s inline UT non-destructive testing inspects weld integrity. Dura-Bond has also installed two leading-edge ultrasonic inspection systems that provide inline monitoring of the seam weld. A new pipe tracking system works in conjunction with sophisticated MTR tracking and tracing software to offer continuous monitoring of product. Additionally, the facility’s logistics capabilities have been updated to improve accessibility to major highway and rail connections. The refurbished plant is now fully operational and has recently been awarded an API 5L Certification to manufacture ERW pipe in diameters from 8 5/8-inch through 20-inch, with lengths up to 80-foot. API-certified pipe must meet rigid quality guidelines as outlined in API Q1. The McKeesport facility’s quality system has been successfully audited and certified as API compliant. The quality of all ERW pipe is fully documented, and each pipe carries the API logo as infield verification. The McKeesport pipe mill is strategically located near the company’s Duquesne, Penn., pipe coating facility. This high-capacity coating plant was built in 2012 to match the application of fusion-bonded epoxy (FBE) and abrasion resistant (ARO) pipe coatings to McKeesport’s steel pipe output. The company recently expanded the coating plant’s capability to economically load and shuttle trucks between the two mills. The company also controls all rail track within the manufacturing complex and monitors onsite logistics of pipe-carrying railcars. Both plant locations offer access to major highways, three railroads and barge transport. Dura-Bond began coating fabricated steel and pipe in 1960 and has grown into one of North America’s leading line pipe producers and plant-applied pipe coating applicators. The company also maintains an advanced protective coating operation at its longitudinal submerged arc weld (LSAW) pipe manufacturing facility in Steelton, Penn., where it produces large OD line pipe from 24 to 42 inches in diameter. The ERW pipe is produced by continuously forming flat steel and welding the longitudinal seam using high-frequency electric resistance welding. The process begins with flat steel passing through a series of forming rolls that transform it into a round pipe section. A high-frequency welder heats the edges of the rolled strip and pressure rollers then squeeze the heated edges together to form a fusion weld. The weld is inspected by an ultrasonic non-destructive unit to assure precise adherence to API and ASTM specifications. The weld seam is then normalized by heating it to 1,700ºF to remove welding stresses and produce a uniform grain structure. Next, it is cooled and passes through the sizing mill. As the continuous length of pipe moves toward the mill’s exit, a flying cut-off slices length of pipe to prescribed sizes without interrupting the production flow. Each pipe undergoes hydrostatic testing to ensure rated strength and weld integrity under pressure. The weld is ultrasonically inspected again, and the pipe body is fully examined by automated equipment. Dura-Bond was founded in 1960 by J.M. Norris to provide corrosion protection services for manufacturers of steel products at the customers’ facilities. In 1965, Dura-Bond established its headquarters and first plant-applied coating facility in the historic Western Pennsylvania town of Export. Today, four Dura-Bond manufacturing facilities are in Pennsylvania’s energy-rich Marcellus-Utica Shale Region, and the company’s products are used in construction projects throughout North America. The company manufactures API steel line pipe for use in critical projects such as the Dominion Atlantic Coast Pipeline, Trans Canada Leach X-Press and the Williams Constitution Pipeline. Dura-Bond provided 550 miles of 36- and 42-inch steel pipe for the Dominion Project. This signature pipeline will encourage increased drilling and the buildout of adjacent midstream pipelines in smaller diameters up to 20 inches. Each plant complements the others by allowing the company to serve a wide range of customer-specific requirements for steel pipe, protective pipe coatings and fabricated steel products, with each facility using distinct manufacturing processes. Dura-Bond has a threefold approach that guides its manufacturing processes – SQP: safety, quality, productivity. Quality is critical to maintaining and expanding any company, and the company invests in mill upgrades and maintenance to remain ahead of increasing quality standards. The Dura-Bond team understands that customer loyalty and trust need to be earned each day and with each project. The pipeline industry operates and maintains critical infrastructure across North America and product integrity and quality are not just appreciated, they are required. Dura-Bond makes it easy for customers to do business by providing solutions to issues and concerns before they become problems. “The Dura-Bond team of professionals is dedicated to building a tradition of pipe manufacturing excellence. Talented individuals throughout the company, from mill operations to front office sales, are committed to maintaining Dura-Bond’s reputation as a quality American pipe supplier and plant-applied coater. Our successful customer relationships are built on this tradition,” said Adam Norris, of the Line Pipe and Coating Division. STEPHEN HUBA | Wednesday, July 18, 2018, 2:03 p.m. Aggressive trade policies by the Trump administration are starting to have a positive impact on domestic steel pipe producers, said the head of an Export-based company. Dura-Bond Industries is better positioned to compete for oil and gas industry projects requiring large-diameter welded pipe under tariffs imposed this year, said Jason Norris, company president. Dura-Bond was part of a small group of pipe producers that petitioned the Trump administration this year to impose tariffs and take other actions to end the glut of foreign steel. Specifically, Dura-Bond asked that steel pipe be included in the 25 percent tariff on imported steel and the 10 percent tariff on imported aluminum announced in March. Under the new tariffs, U.S. companies are allowed to seek exemptions if domestic companies do not make metals needed for their projects or if those metals can’t be produced to the desired quality or quantity or within a specific timeframe. The steel tariff is starting to have its desired effect, Norris said. “Companies are more willing to come in and evaluate us after the reduction in supply from foreign mills,” he said. Dura-Bond makes and coats large-diameter steel pipe mostly for use by the oil and gas industry at facilities in Export, Duquesne, Mc­Keesport and Steelton. In late 2016, Dura-Bond acquired the idled assets of the U.S. Steel McKeesport Tubular Operations in order to repurpose it for the manufacture of smaller, midstream pipe. The plant is fully operational now that it has received an American Petroleum Institute certificate covering diameters from 8 5 ⁄ 8 inches to 20 inches, Norris said. Trump’s tariffs have prompted hundreds of waiver requests from U.S. companies claiming that the steel product they need is not available domestically. The U.S. Commerce Department recently approved such tariff exclusions for Shell and Chevron. The Commerce Department, however, denied a waiver for the Houston-based Plains All American Pipeline LP, which is building the Cactus II crude oil pipeline — a $1.1 billion project being built in West Texas — with pipe from Greece. Dura-Bond and two other pipeline producers objected to the waiver request. Plains All American stated in its request that 26-inch diameter pipe is not available in the United States, but Dura-Bond manufactures 26-inch pipe at its plant in Steelton, Norris said. This week, the Commerce Department revealed that of 26,400 exclusion requests submitted, 267 have been approved, 452 were denied and 3,385 were rejected for being improperly completed, Reuters reported . The American Petroleum Institute, a national trade association representing the oil and gas industry, on warned Tuesday that denying tariff exclusions for imported steel could negatively impact the U.S. natural gas and oil industry and affordable energy available to consumers. API appeared to react to the Plains All American denial without actually naming the company. Dura-Bond also recently received a favorable ruling from the Commerce Department in its antidumping/countervailing duty complaints against China, India, South Korea and Turkey. Producers from those countries are accused of “dumping” steel pipe — that is, selling the product at less than fair market value — in the United States and of receiving unfair subsidies from foreign governments. In February, Dura-Bond and four other producers asked the Commerce Department to investigate the four countries, as well as Greece and Canada, and to take action in the form of antidumping duties. In June, the Commerce Department issued a preliminary ruling against the countries, asking U.S. Customs and Border Protection to levy duties to offset the negative effects of the subsidies. A final ruling is expected by Nov. 6. A preliminary ruling on the companion antidumping complaint is expected by Aug. 20, Norris said. 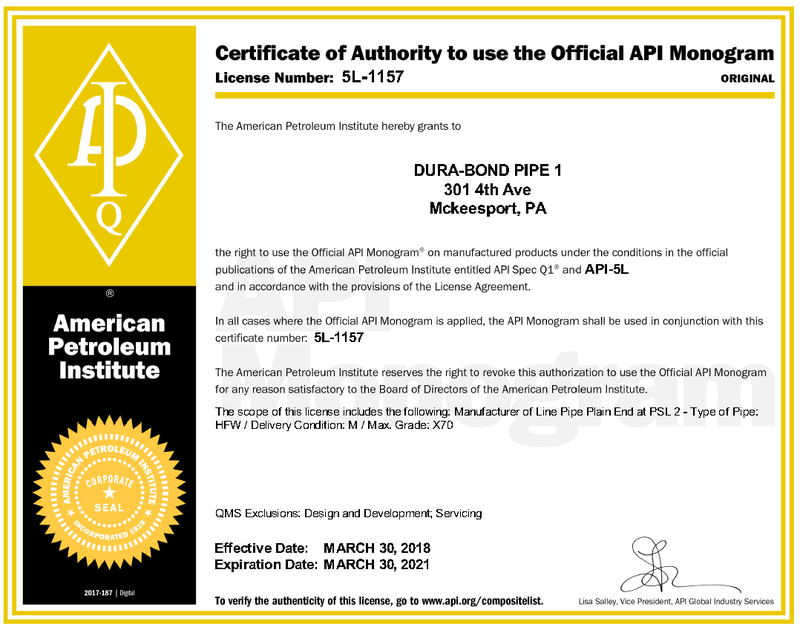 Dura-Bond Pipe, is pleased to announce that we have received our API 5L Certificate to manufacture HFW Pipe in diameters from 8 5/8” through 20” in lengths up to 80’ long. Dura-Bond acquired the idled assets from United States Steel in late 2016 and is fully operational after a one year effort to bring the mill back up and earn our license. Building on our reputation for quality large OD LSAW pipe that we produce in Steelton, PA in diameters from 24” through 42”, the McKeesport HFW mill will now allow us to offer our customers a wider range of sizes and provide a steady supply of pipe for our new FBE plant in Duquesne, PA. Locations and Maps have been updated for ease of travel. Dura-Bond has remained in Export since 1960 and is proud to contribute to the surrounding community by remaining a staple of this historic Western Pennsylvania town. For the past year Dura-Bond has been manufacturing and coating 30-36″ and 42″ Pipe for ACP. These wonderful drone photographs show the enormity and scale of this project and the monumental benefit of jobs created both past and present. We at Dura-Bond Pipe are proud and excited to see the hours of continued employee and management effort put forth on display. George Thompson has been announced as Dura-Bond’s new Executive Vice President, Commercial, Tubular Products. He will be responsible for the Sales, Marketing and Sales Support of Dura-Bond’s LSAW and ERW pipe. Prior to joining Dura-Bond, George was VP, Sales & Marketing at C P Industries. He spent most of his career at United States Steel, where he held positions of increasing responsibility throughout the organization over 27 years, ending his career at US Steel as VP, Commercial, Tubular Products, the same group he started with in 1987. Mr. Thompson was responsible for leading U S Steel’s commercial organization as U S Steel Tubular changed from a pipe supplier to distribution within the energy industry to a solution provider for the Energy industry. He lead the commercial group as US Steel Tubular and the former Lone Star Tubular were combined in 2007 to create the largest Energy Tubular supplier in North America. George’s strengths are his knowledge of the ever changing tubular supply chain that has become necessary to serve the energy industry in North America. He has strong relationships throughout the industry, developed in the field over his 30 years of service. He is a proven leader with strong team building skills that benefit company and customer alike. His record of accomplishment at every level speaks for itself, leading U S Steel Tubular Products to record revenue and income over his last seven years of service at U S Steel. Mr. Thompson holds a bachelor’s degree from Allegheny College, Meadville, PA.
George was born in Pittsburgh, PA, but has lived throughout the US. He currently lives on Oakmont, PA, and he enjoys everything about his two wonderful children, George, age 16, and Libby, age 14. In his free time, he is an avid golfer and runs for exercise. Dura-Bond Piple LLC has reached a new company milestone. We produced one million feet of 42″ diameter x .600″ wall X70 for the Atlantic Coast Pipeline. This is about 25,000 pieces for a total of 132,000 tons (enough steel to build multiple aircraft carriers) and we still have much more to make. A special thank you from Dura-Bond to all employees working on this project. Dura-Bond would also like to thank Atlantic Coast Pipeline for it’s continued confidence in Dura-Bond for it’s outstanding reputation to produce quality Large Diameter LSAW pipe. Due to the overwhelming amount of calls received about future employment at Dura Bond, please refer to our online application. Your resume will be automatically sent to Dura-Bond Industries for review. You can also submit a scanned copy or direct any questions to a direct email listed below. Thank you for your patience and interest in potential job growth from Dura-Bond.